I am still going through my collection of vinyl, and I continue to marvel how great they sound. I have to give some of that credit to myself for keeping the collection in good shape, but I can’t ignore how well this turntable from the ’80s has held up and performs as if brand new………………….. This was Harman Kardon’s top of the line turntable in the 1980’s. I remember investigating long and hard over what to buy back then. Harman Kardon was not a new name in audio, as they manufactured well made audio components (primarily top notch receivers and integrated amplifiers) for years. 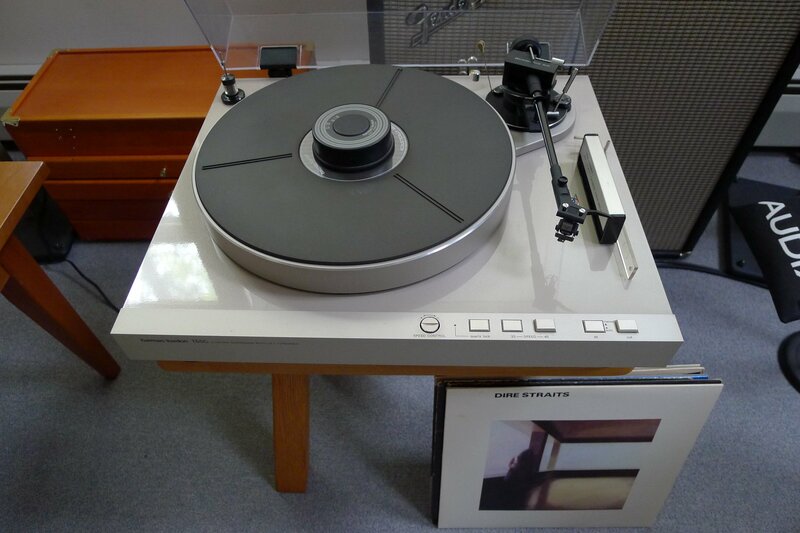 This was to replace my beloved, but a bit old in the tooth, Acoustic Research turntable. The AR was my first piece of audiophile equipment I ever purchased, but it was time to let it go. The HK T65 was far superior in many ways, although the AR is still a vintage icon to this day. 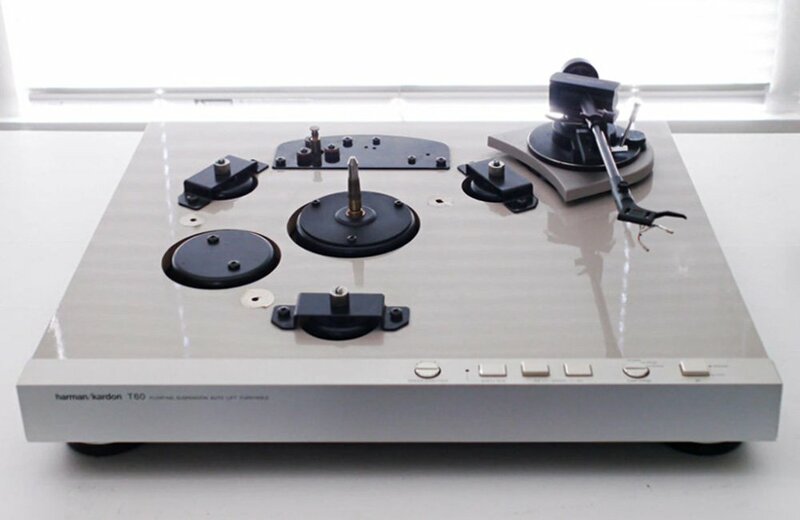 The design of the HK T65 incorporates all the bells and whistles that were being incorporated into well made turntables near the end of their run. Heavy, non-resonate MDF base, a weighty aluminum platter, adjustable string and weight antiskate device, adjustable capacitance dial, and a Microrace ITO carbon fiber tonearm. 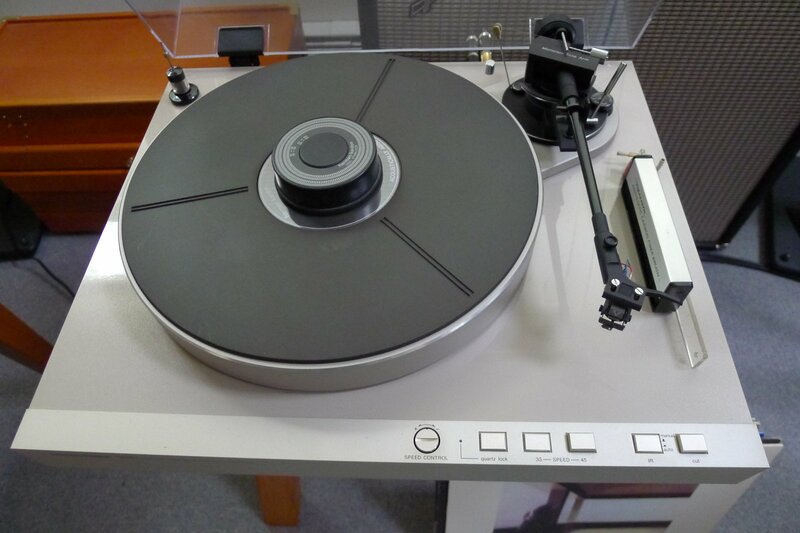 It also has an electronic photo eye, auto lift feature which allowed a no resistance motor lift of the tonearm from the take out grooves of the finished LP. There seems to still be a bit of a cult following for the HK TC series turntables, and they have been compared favorably to other top models from past manufactures, such as Thorens and Garrard. With a resurgence in the interest of vinyl, there are a few new options for turntables, although they seem to fall at the extremes of build quality. Newer, inexpensive turntables are of pretty dismal quality, and the ultra high end audiophile tables still being built can bring crazy sums of money. This leaves the affordability of vintage turntables that have been treated well through the years a great place to look for a quality table. Who listens to vinyl…………. ?